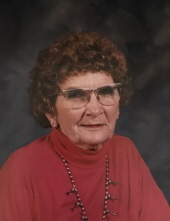 Mary Ann Louise (Younger) McKay passed away on Tuesday, April 10, 2018 in Ponca City, Oklahoma. Mary Ann was born in 1926 in Ponca City the daughter of Roy Cap and Madonna Esther Younger. She attended Ponca City Schools. Mary Ann married Ralph McKay, Jr. in Ponca City on February 2, 1944. Mary Ann had a gift for talking to anyone and everyone, which made her an excellent greeter at the Conoco Museum for nine years. Mary enjoyed gardening, sewing, cooking for family and friends, swimming, and bird watching. Mary Ann enjoyed working on ceramics so much that Ralph built her a special room to do just that. Many will remember seeing Mary and Ralph riding their bikes from one end of Ponca to the other each day. This prepared Mary for her annual participation in the Tulsa World Free Wheel bike ride which started at the Texas boarder and ended at the border of Kansas. She completed the ride eleven times. One of her greatest joys was traveling, meeting new people and learning about local cultures. She enjoyed her trips to Alaska, Mexico, China, Australia, England, Canada, Ireland, and Italy, to name a few. Mary was preceded in death by her husband, Ralph McKay, Jr., granddaughter Kristen Streeter and son Monte McKay. She is survived by son, Michael McKay and wife Phyllis of Ponca City, daughter, Sandra Louise Henderson and husband Bennie of Ponca City, daughter-in-law, Helen Dorsey McKay of Edmond, Oklahoma, grandchildren, Brad Streeter and wife Christina of Wichita, Machelle Petersen and husband Daren of Mustang, and Mark McKay of Ponca City, three great-grandchildren, Angela McKay of Ponca City, Jacob Streeter of Wichita and Sara Streeter of Wichita, one great-great grandchild, Zandyn Wallace of Ponca City, brother, Harold Younger and wife Barbara of Ponca City, nieces, Stephanie Younger Kotarski of Anchorage, Alaska, Suzanne Younger Kline of Coppell, Texas, Cindy Morrison of Edmond, and nephew Steve McKay of Ponca City. A memorial ceremony for Mary Ann will be held on Monday, April 16, 2018 at 2:00 p.m. at the Trout Funeral Home Chapel with Reverend Robert Montgomery officiating. Following the ceremony, she will be laid to rest next to her husband at Odd Fellows Cemetery in Ponca City. In lieu of flowers, memorial donations may be made in her honor to the Opportunity Center, 2225 N. Union, Ponca City, OK 74601.